Leaving Scepan Polje, on the border with Bosnia & Herzegovina, we headed South. The mountains have been exquisite, but also wet and rainy and we are now ready for the coast and some sun. 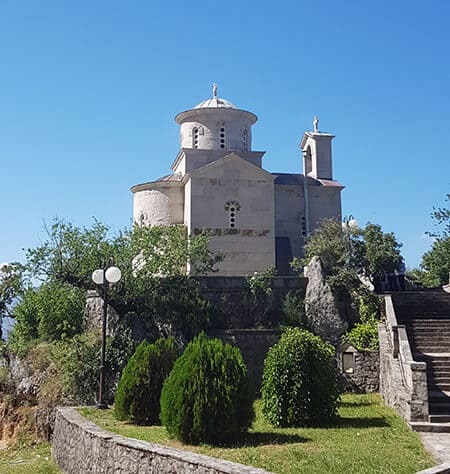 On today’s route, we stopped at Pluzine, Pluzine Monastery, Izlazak Ethno Village, Lake Slano and the famous Ostrog Monastery. This time I knew what was ahead of me on the road so was prepared for all the tunnels and the drive over the ridiculously high bridge and dam wall. We stopped to have a closer look at the dam wall. I don’t mind heights, but my knees felt wobbly just peering over the edge! The sun was out and the water of the Piva River sparkled its gorgeous blue alongside us. We took our time, stopping often to take photos and to let cars past us. Before I knew it we were in Pluzine. 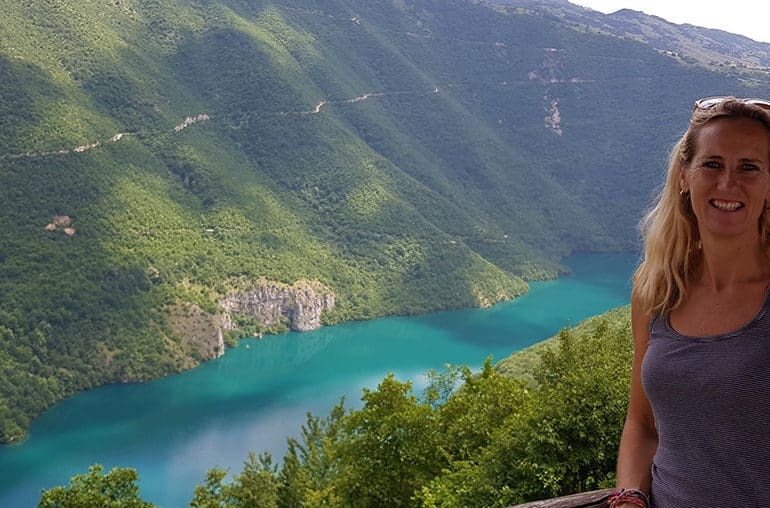 I had heard about a cruise on the Piva River that took you to two caves and a place for swimming and included breakfast, lunch, and drinks. It sounded like a fabulous day out, but on enquiring, I learned that the boat was broken so no tour. There was a one hour cruise you could do for €15, but after the lure of the full day tour, a one hour putter around the lake didn’t quite do the trick. We decided instead to climb up the hill behind the town. A good 1.5hr hike up, with stunning views from the top. We hadn’t enjoyed the Evergreen Campsite when last we were in Pluzine, so I organised with the owner of the Eko Piva Restaurant to park in their private parking lot, on condition that we ate at the restaurant of course. We parked up, got our trainers on and packed a bag for the hike and then the heavens opened! Okay, let’s skip the hike. The next morning we did a little hike around Pluzine. 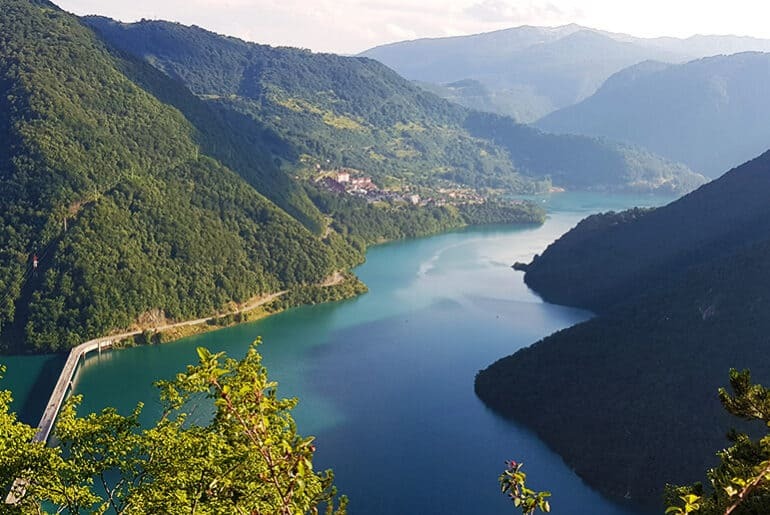 Considering the beauty of the Piva Lake, the town of Pluzine is rather unattractive. We did find a lovely little church up on the hill with gorgeous views out over the town and the lake. We then continued our Southbound journey with our first stop at the Piva Monastery. 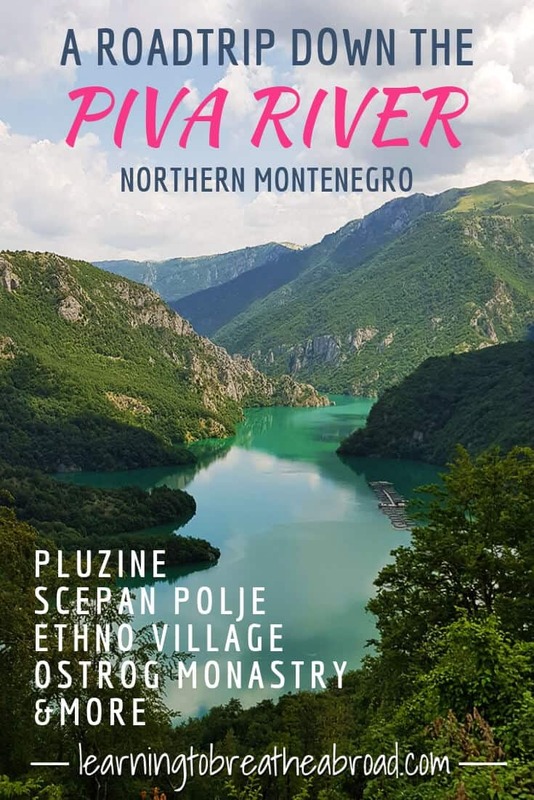 The Monastery was originally situated close to the Piva River, but when the dam was built the monastery would be flooded, so the entire building was moved, stone by stone, to a new location. It now sits perched on amidst beautiful gardens, high up above the river and miraculously they managed to keep the original frescos intact. I saw a sign to the Izlazak Ethno Village, so decided to take a look and see if they had a restaurant for lunch. It turned out to be one one of those magical finds. The road was a narrow one lane through the hills and fields and we had a couple of tight squeezes getting past other cars. I’m getting quite used to these squeezes now! The Ethno Village was right on top of a hill overlooking a gorge with a finger of the Piva River sparkling up at us. 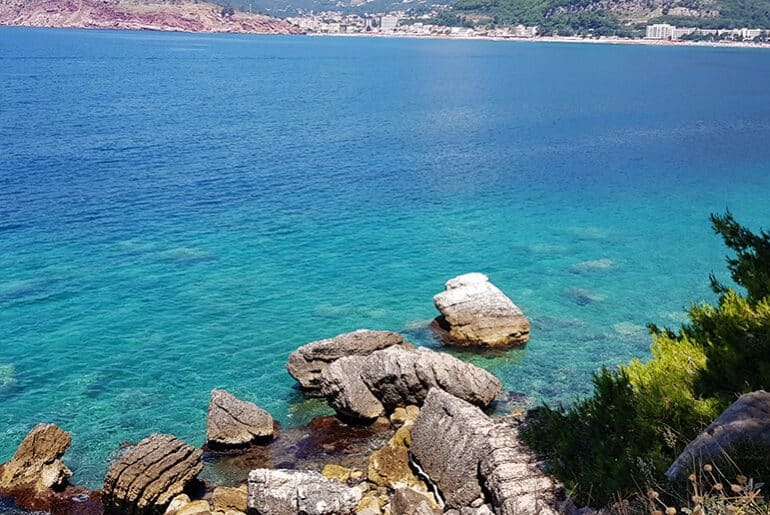 I know I go on about it, but really, the turquoise colour of this water is something you have to see to believe! The menu’s in Montenegro always state the number of grams of meat per portion and they range from 300g to 1000g! Can you imagine ordering 1000g of roast lamb? We got the mixed meat 600g option – to share please! I’d been trying to find out if it was possible to drive a campervan up the Kotor Serpentine road and there was a group of 20 Italian men doing a motorbike tour, so I thought they might know. I got chatting to a lovely Italian man from Genoa, Lorenzo, and their tour guide, but only ever having driven the serpentine road on a motorbike they couldn’t give me the answers I was looking for. We left a few minutes before them and as they passed, each one tooted their horn and gave us a wave – all 20 of them! We passed Lake Krupac and then skirted the town of Niksic, heading to Lake Slano. The valley before Niksic looked like a postcard with all the red-roofed houses dotting the patchwork hillsides. There were some super friendly local lads at Lake Slano who, on hearing our squeals, helped us get a wasp out of Miles McFlattery. They said we could swim and the water looked lovely, but there was so much plastic and rubbish about that it rather put us off. We decided to push on to the Ostrog Monastery, built into the side of the mountain. This is when the road got a little trickier. The Monastery is halfway up a mountain so, up, up, up we went. The road seemed to get narrower and narrower with some sections only wide enough for one vehicle. Let’s not talk about the sheer drop down the side! A bit more squeezing with oncoming cars and a few tight hairpin bends and we had reached the parking lot. Phew! 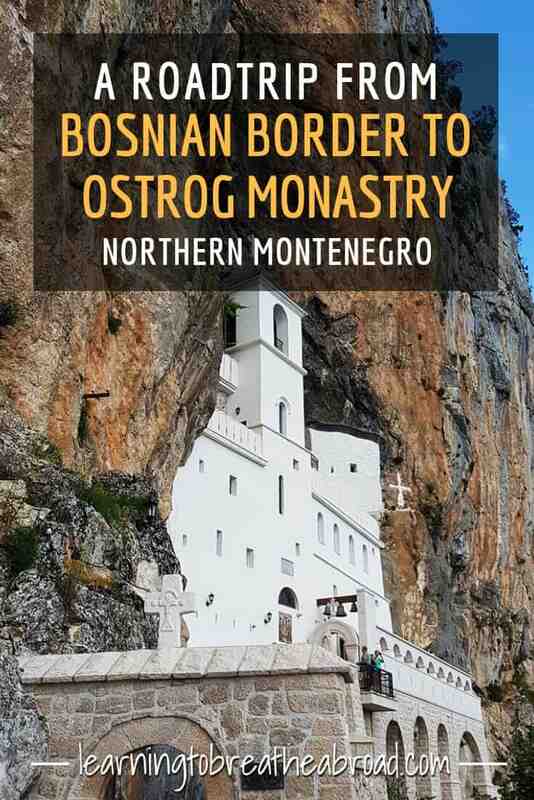 You can access the Ostrog Monastery from either Niksic or Danilovgrad. We arrived at the monastery via Niksic, which as I said, was a tight squeeze and very scary. on leaving, we headed towards Danilovgrad and this road was much bigger, wider and virtually brand new. I’d highly recommend the route via Danilovgrad, especially if you’re in a campervan. 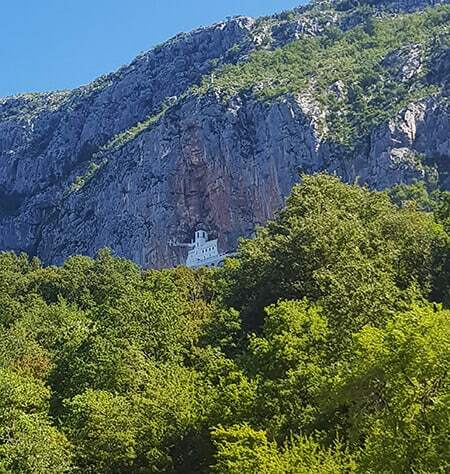 The Ostrog Monastery is the most sacred site in Montenegro and has a continuous stream of pilgrims visiting. It was prayer time when we got there and the priests were busy chanting the cantations through a loudspeaker. The atmosphere at the monastery was amazing, peaceful and reverential, so we just sat and enjoyed the moment. After prayers, we followed people into a tiny chapel in the rock. Only 6 people could fit at a time, so we couldn’t see what was happening in front. We are not religious people, but the next thing I knew we were in a queue to kiss a wooden cross held by the Orthodox priest. With only 6 others in the room, there was no ducking out of this one, so kiss it we did! We were going to spend the night in the parking lot when clever Tai found a plug socket at the toilet block. We hooked up and managed to charge all our electronics. What a win! We were very high up the mountain, so had the most incredible view out over the valley and were even blessed with a stunning sunset. All in all a great place to spend the night. Well, Son, we’re halfway up a mountain, it’s that or nothing! We wild camped in the parking lot right next to the Ostrog Monastery. The views out over the valley were incredible and we were treated to a magnificent sunset. There are toilets and we managed to connect to electricity as there was a plug socket in the toilet block wall.